ALK-rearranged non-small cell lung cancer (NSCLC) represents a molecular subgroup with high sensitivity to ALK inhibitors. Crizotinib, a US Food and Drug Administration (FDA)-approved tyrosine kinase inhibitor for treating ALK-rearranged NSCLC, has shown remarkable response in ALK-positive NSCLC. However, heterogeneity of clinical responses exists among different ALK fusion partners. Several small studies have investigated the correlation between fusion partners and efficacy, but not yielded consistent results. We investigated the prevalence of ALK rearrangements in a Chinese NSCLC population, and correlated clinical outcomes of crizotinib with different ALK partners/variants. 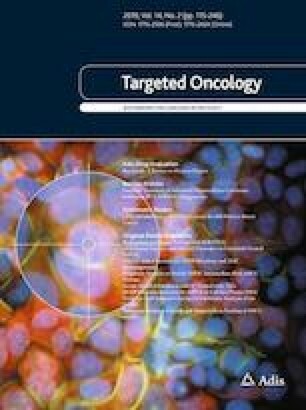 We retrospectively reviewed genomic profiling and clinical data of 110 ALK-rearranged NSCLC patients from five centers. The clinical response to crizotinib and survival data in ALK-positive patients was retrospectively analyzed. A total of 134 ALK rearrangements with 39 partners were identified in 110 patients (5.6%) among a cohort of 1971 NSCLC patients. The most frequently occurring ALK fusion partner was EML4, which was identified in 71.6% (96/134) of all of the rearrangements in 87.3% (96/110) patients, and with variant 3 (41/96, 42.7%) as the main variant type. No statistically significant differences in terms of progression-free survival (PFS) and overall survival (OS) were found between EML4-ALK and non-EML4-ALK NSCLC patients in our cohort (PFS, p = 0.207; OS, p = 0.678). Outcomes did not differ significantly between patients above and below 40 years of age (PFS, p = 0.427; OS, p = 0.686), nor between patients treated with crizotinib in different lines of therapy (PFS, p = 0.171; OS, p = 0.922). For EML4-ALK-positive NSCLC (n = 96), patients harboring variant 3 or variant 5 displayed significantly lower PFS and OS than those with other variants (PFS, 8.6 vs. 11.3 months, p = 0.046; OS, 31.0 vs. 37.6 months, p = 0.026). In addition, patients with a single EML4-ALK rearrangement event displayed favorable PFS (10.0 vs. 7.2 months, p = 0.040) and OS (36.0 vs. 20.0 months, p = 0.029) compared to those harboring multiple ALK rearrangements. This study illustrates the patterns of ALK fusion variants present in Chinese NSCLC patients and might help explain heterogeneous clinical outcomes to crizotinib treatment according to different ALK fusion variants. Yudong Su, Xiang Long, and Yang Song contributed equally to this work. The online version of this article ( https://doi.org/10.1007/s11523-019-00631-x) contains supplementary material, which is available to authorized users. We would like to acknowledge all of the patients and their families for their contributions to this study. This study was funded by Beijing Natural Science Foundation (7182132), Major projects of the Beijing Municipal Science and Technology Commission (Z171100002017013), Capital Special Project for Featured Clinical Application (Z151100004015157), The Peking Union Medical College Hospital Youth Fund (PUMCH-2016-2.25, HI626500), PUMC Special Youth Teacher Project (2014zlgc0717), PUMC Special Youth Teacher Project (2014zlgc0135), Science and Technique Foundation of Tianjin Public Health Bureau (No.2015KZ085), and The Clinical Trial Foundation of Tianjin Tumor Hospital (No.C1712). Yudong Su, Xiang Long, Yang Song, Peng Chen, Shanqing Li, Huaxia Yang, Pancheng Wu, Yanyu Wang, Zhongxing Bing, Zhili Cao, Lei Cao, Yijun Wu, Zhe Zhang, Jing Liu, Bing Li, Jianxing Xiang, Ke Ma, Tengfei Zhang, Lu Zhang, Xinru Mao, Hao Liu, Puyuan Xing and Naixin Liang declare that they have no conflicts of interest that might be relevant to the contents of this article.